This Mazda Miata convertible top is the one-piece design similar to the newer MX5. It fits all 1990 through 2005 convertibles, including ones with glass windows. It is made from the same materials and quality as your two-piece factory original style convertible top, but because of the design change, is less expensive to manufacture and value priced. It has been stitched with matching colors using the finest bonded polyester threads and is ready to install, with no sewing required. You will reuse some existing components from your existing convertible top and we have a do-it-yourself installation guide available by email upon request after placing your order. Includes professionally installed rain rail. 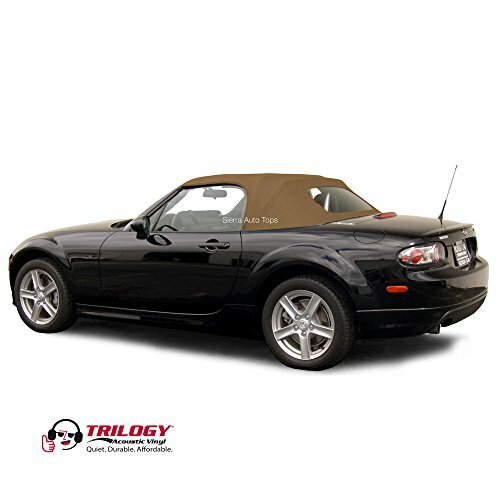 This is the original factory style 2 piece design Miata convertible top with deck seams and overlapping quarter panels. Includes pre-punched plastic retainers to ease installation. The window on this item does not have a zipper. 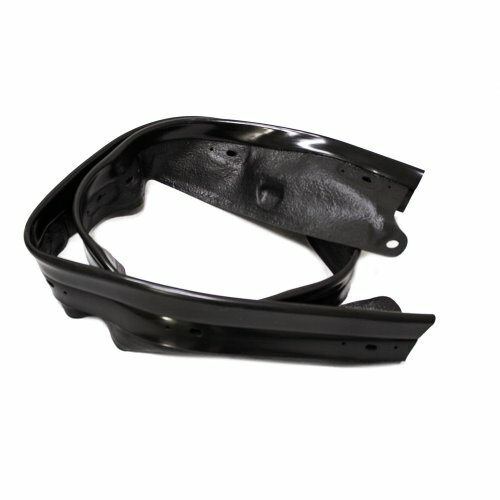 Fits all 1990-2005 Miata / MX5 convertibles. The convertible top will fit older model Miata's that original came with a plastic window. 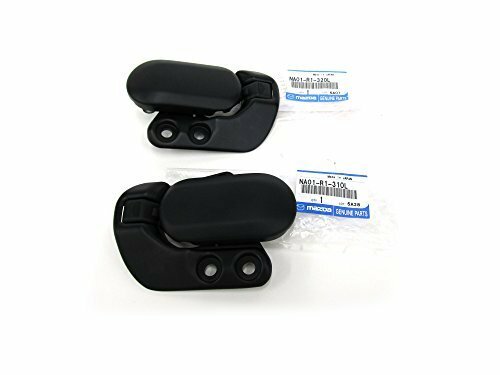 Connecting the defroster glass in these models is not recommended unless you purchase the Mazda 3-Wire Connector Part Number N007-67-060A from Mazda. However, you can still enjoy the glass window without the defroster. 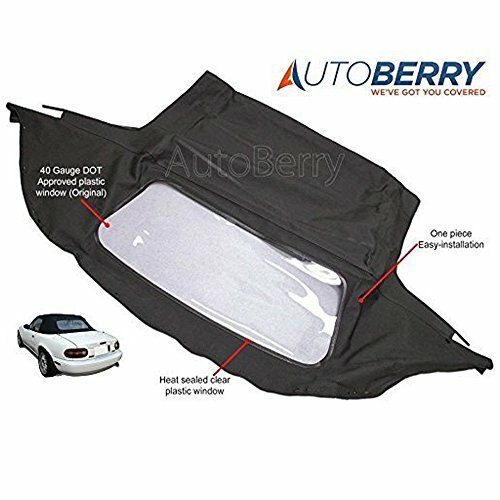 If it's time to replace your old, worn convertible top, then you will not go wrong with one of our new Miata soft tops made from high-quality fabrics, zippers and windows. This is the one-piece top with an integrated press-polish plastic window. The window is a clear 40 gauge UV coated plastic for superior visibility and resistance to UV damage. The material is dual-ply composite with heavy duty outer layer PVC and a 100% Polyester laminated backing for longer life and greater flexibility. The top deck is made with a deck seam down both side. The seams are di-electrically welded using specialized equipment. Seams are double-stitched for exceptional durability. This is the convertible top RAIN RAIL, which is required for all 1990-2005 MX5 Miata tops. The Rain Rail channels water to the drain holes in the convertible top well. A cracked rain rail will allow water to overflow into the vehicle. This Rain Rail is the most flexible on the market today. It is made of rubberized PVC that is so pliable that it can be rolled into a coil. This would cause factory original and other rain rails to crease and crack. 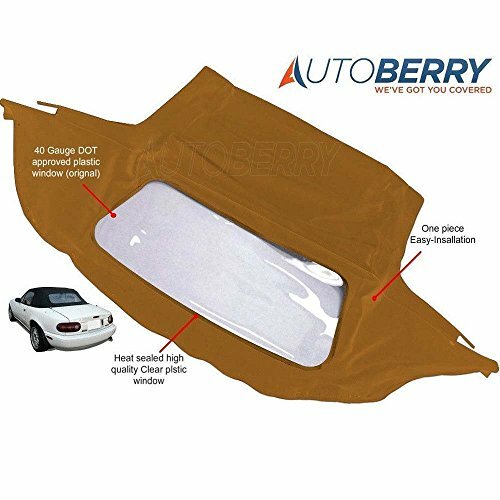 Designed to fit all 2006-2015 model year Mazda Miata / MX5 convertible, this high quality convertible top will keep your car looking its absolute finest. Includes a new tinted glass window and is made from, a heavier than sailcloth, Trilogy Acoustic Vinyl. We developed this superior vinyl material to be heavier, quieter, more durable and more flexible than other vinyls. It is an acoustically enhanced vinyl with a twill (cloth-like) pattern and 100% polyester backing for superior strength and longevity. Black Stayfast Canvas with Heated Glass Window. 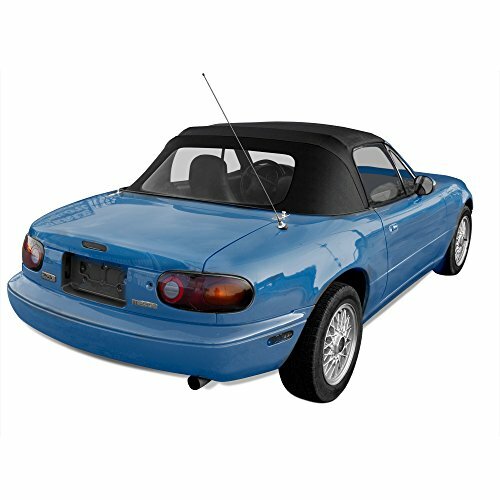 This convertible Top is an excellent factory style glass window replacement for the 2006-2015 Mazda MX-5. It is the original factory one-piece design with listing panel and no deck seams. It includes pre-punched plastic retainers to ease installation. 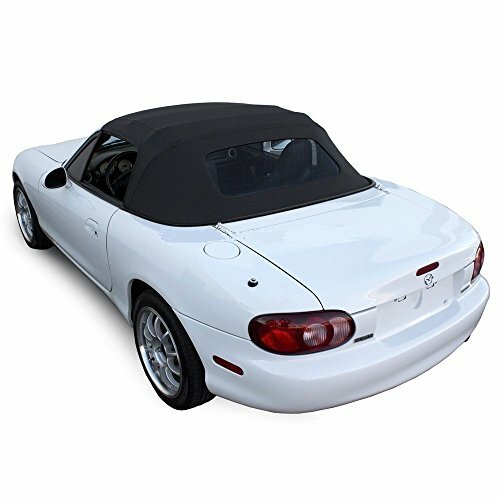 This convertible top is the Miata original factory one piece design with listing panel. 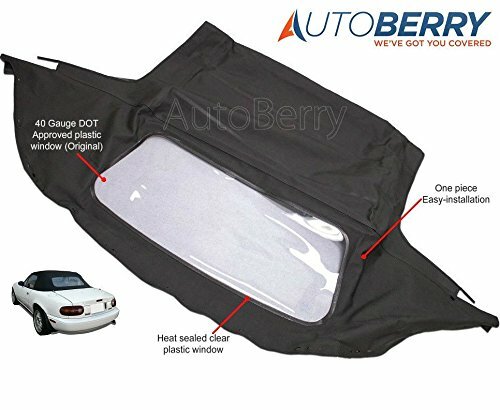 The rain guard is sewn along the sides of the top. Includes a new tinted DOT approved glass window with embedded defroster wiring. The window is bonded to the convertible top using an advanced window bonding system that is guaranteed to not fail for 5-years. There is no piping or stitching around the window visible and no unsightly heat-seal press marks. This top is made from Haartz Stayfast Canvas, which was an original material beginning in 2003. Although it is not an original material as prior models, it makes an excellent upgrade from Vinyl because of its richer look, silkier feel and improved durability. Looking for more Mazda Miata Convertible Top similar ideas? Try to explore these searches: Serpent Eagle, Tie Rod Separator Pickle Fork, and King Heated Blanket. Shopwion.com is the smartest way for comparison shopping: compare prices from most trusted leading online stores for best Mazda Miata Convertible Top, Polyethylene Mailers, Enough Short Sleeve Tee, Mazda Miata Top Convertible . 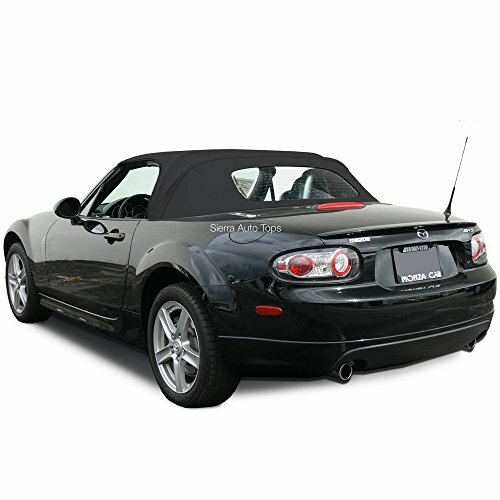 Don't miss this Mazda Miata Convertible Top today, April 26, 2019 deals, updated daily.